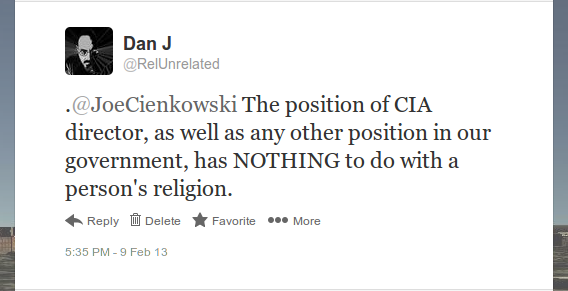 The rest of our brief exchange on this subject went as I expected it to.
.@JoeCienkowski The position of CIA director, as well as any other position in our government, has NOTHING to do with a person’s religion. @RelUnrelated this is where beliefs like yours become dangerous. 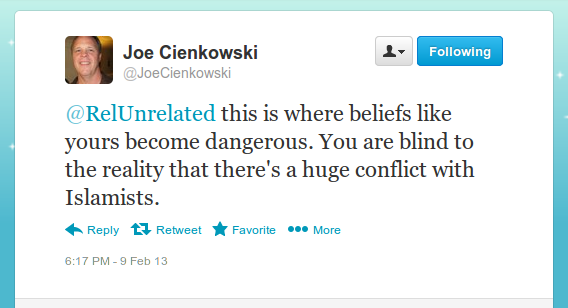 You are blind to the reality that there’s a huge conflict with Islamists.
.@JoeCienkowski Joe; just because someone is a Muslim doesn’t make them a terrorist. Misinformation is making a segment of our population dangerously afraid of anyone who happens to be Muslim or who appears (to them) to be of Middle Eastern descent. The blatant sources of misinformation are easy enough to identify, but not easy to counter. When lies are profitable, and protected speech, what more can we do than continue to point it out? There is an Islamist problem that we should be worried about, and a Christian problem as well. In fact it is a problem that exists at the nexus of religion and politics in almost every society. Whether it is Sharia law or banning Stem cell research, any time religion informs the politics of a society someone will lose.